Swimming with turtles in Barbados. Picture courtesy of Shutterstock.com / Willyam Bradberry. 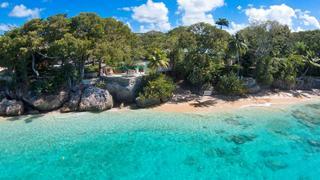 The villa's beach is the perfect spot for yoga classes. Spending the afternoon at Apes Hill Polo Club. 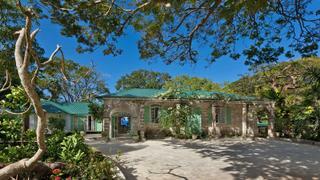 There are a myriad of activities in Barbados. Picture courtesy of Joanne Weston. 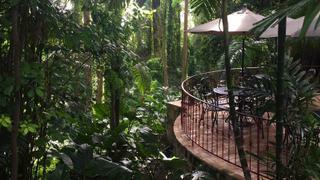 St Nicholas Abbey's beautiful rainforest patio. 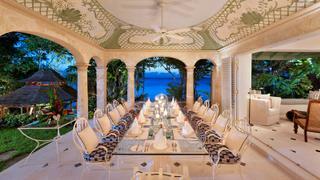 The beautiful Oliver Messel designed dining area. The sunset view from Crystal Springs' annex patio. 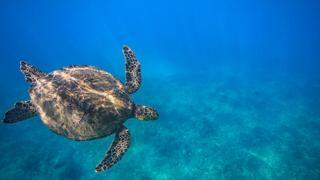 Floating in warm glassy Bajan waters, a turtle glides elegantly below, peering serenely at the pairs of goggles and snorkels watching from the surface before spiralling to catch a snack towards the seabed. It’s idyllic, the golden rays glancing off the surrounding silk-like waves, but the experience doesn’t end here. Seconds after speeding back to the villa’s private beach I’m sitting up on the lofty stone-walled annex patio watching one of the best Caribbean sunsets I've ever seen, an icy mango cocktail in hand that was presented to me as I climbed the stone steps up from Cove Beach. The Blue Sky Luxury (BSL) Crystal Springs villa sprawls across 1,114 square metres of land, its five buildings intermingle with the surrounding verdant trees that envelop the ten en-suite bedrooms for up to 20 guests. Mango trees reach towards the sky while monkeys chatter on the rooftops. 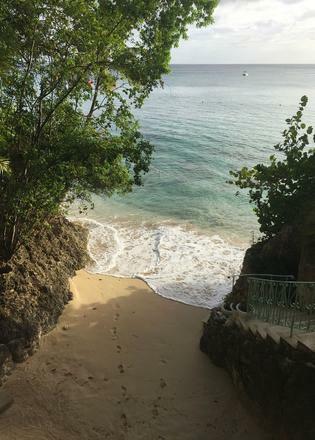 A gully path overflowing with tropical plants unravels below, leading to the soft golden beach, which is easily accessible by tender and is one of the best beaches in the Caribbean. Each morning, I rise with the light that floods my poolside room. One day I stroll to the beach for a yoga session, where the pale sunshine bathes the bay while the rolling waves send a welcome breeze up the beach. On another, I opt for a sunrise meditation class serenaded by native birds. For a more invigorating start to the day, I conquer turquoise surfs atop a paddleboard, in spite of my lack of upper arm strength, it is the perfect exhilarating activity to work up an appetite before breakfast. 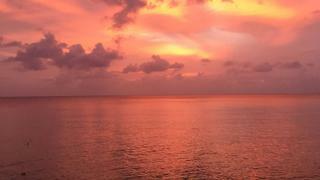 There are a myriad of activities to do in Barbados. 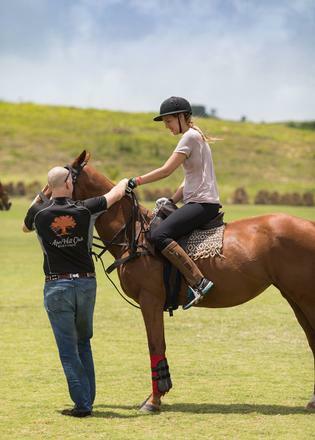 Sportier guests can take advantage of the Apes Hill Club, offering polo, golf and tennis. With an 18-hole par-72 championship course to play with at the heart of Barbados’ lush green forests, keen golfers will remain well entertained while others can opt for a polo lesson at the on-site school. These elegant ponies are ludicrously well trained, moving with the mildest commands. Sitting atop the sleek chestnut Furia, I canter around the paddock, letting my mallet pendulum towards — and past — the ball on the ground by her hooves. By the end of the session I’ve hit the ball a few times and while I won’t be giving the professionals a run for their money any time soon, it made for a thoroughly enjoyable afternoon. From my private beachfront yoga lesson at 6am to the candlelit saxophone concert on the gazebo terrace in the evening, this is everything I would expect of a bespoke vacation. It’s a well-balanced cocktail of adrenaline-pumping pursuits, relaxing pastimes and exquisite cuisine. The concierge team at BSL has an uncanny knack for taking experiences to the next level — because what would a ‘spontaneous’ trip up to the Cherry Tree Hill east coast vantage point be without sweet blue snow cones to enjoy with the extraordinary view? Of course, it’s not solely active pursuits. While Barbados is a pinnacle of the Caribbean lifestyle, it’s a stunning island with its own fascinating culture. Rum connoisseurs can request a private tour of St Nicholas Abbey, a converted sugar plantation with 350 years of history in its colonially styled walls. Having watched heavy iron wheels crush huge branches of sugarcane between their teeth, I could taste the effort that went into producing the range of golden tipples, now bottled in the main house. Using only traditional methods, the St Nicholas Abbey rum is distilled through a vast copper pot still named ‘Annabelle’. Sipping a rum punch on the patio surrounded by swathes of shining green rainforest, which is alive with birdsong and chattering animals on the forest far below, I feel the clock slow down, allowing me to bask in this perfect setting. Now a noticeably safe, harmonious and desirable spot, the island is famously popular with British holidaymakers due to a combination of high-end luxury offerings and the small hints of British history that can be found in the island’s architecture and design — in fact, Crystal Springs was created by celebrated 20th century stage and costume designer Oliver Messel, who was born in London in 1904 and renovated 26 houses in Barbados and Mustique. “It’s popular because of the familiarity in our British roots, the many Colonial traditions and customs that holidaymakers identify with and appreciate, even with a local twist,” says Cathrow. It’s the perfect spot for entertaining and hosting large groups, or even providing overflow accommodation from your superyacht — simply tender in to Cove Beach. Messel’s passion for open spaces and for combining outdoor with indoor living is recognisable in the property’s layout. His favoured sage green is used throughout, there are cooling stone floors and an al fresco dining room, in which I sample extraordinary dishes from the kitchens. The space is perfectly positioned to gaze out to sea and, as I tuck into a creamy cucumber gazpacho starter served in a coconut, thousands of stars puncture the dark velvety sky. With direct flights from London it might be easy to treat Barbados merely as the starting point of your superyacht vacation, but as soon as your feet touch Bajan soil, it becomes much more. Meet your superyacht at Port St Charles, drop anchor outside an incredible sea line villa and immerse yourself in the Bajan culture while surrounded by loved ones — it’s possibly the best way to get into the Caribbean frame of mind ahead of your island-hopping adventure. With a portfolio of over 120 best-in-class properties and over 30 years of experience on-island, Blue Sky Luxury offers the very best of Barbados to discerning travellers. Ranging from luxurious oceanfront villas to inland heritage plantations and chic beachfront apartments, they exclusively represent and seamlessly manage the island’s most prestigious homes.